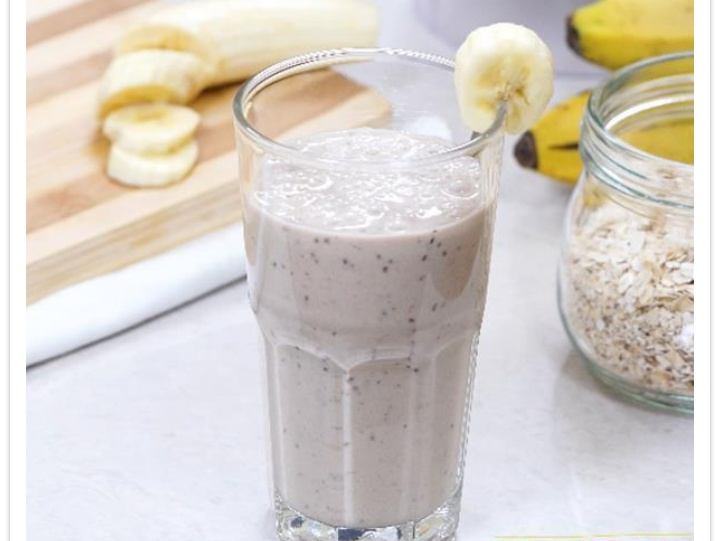 Start your morning off with this thick and creamy Banana Oat Breakfast Smoothie that is healthy, delicious and super quick to make! It’s also dairy-free and vegan with zero refined sugar! I don’t know about you, but most of us just don’t have the time in the mornings to throw together a healthy breakfast which is why I love to make smoothies! Fruit smoothies are absolutely delicious, don’t get me wrong, but some times you just need to switch things up and enjoy something a little more filling! This banana oat breakfast smoothie is thick and creamy with such a delicious texture that’s different from your typical smoothie because it’s blended with oats, creamy yogurt and ground flaxseed meal which adds a delicious, nutty flavor to the smoothie as well! Flaxseed is really great for you which is why I always like to throw a tablespoon or two into my smoothies in order to get the benefits without the taste. Flaxseed meal is a great source of protein and fiber, as well as a rich source of vitamins and minerals so starting my day with it really makes sense! 1. In a blender, add 50 grams oats, 200 grams banana, 1 1/2 tablespoons honey, 2 tablespoons peanut butter, 1 tablespoon chia seeds, 300 milliliters almond milk and blend until smooth. 3. Garnish with banana slice.